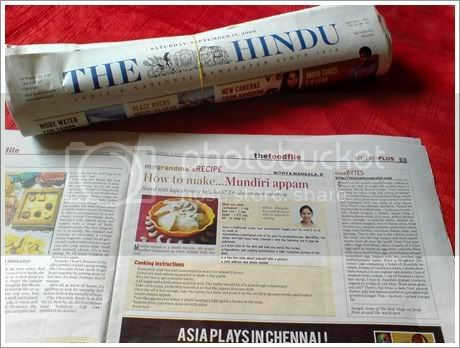 My Mundhiri Appam recipe has been featured in Hindu - Metro Plus weekend edition. ohh Congrats nitya great job dear wish you many more like this. Congrats Nithya, great work dear..keep rocking! Congrats, very happy for you.You truely deserve it! That is soooooo cool! Congratulations, Nithya! hey.......is tht u, dear! !...morning, i read tht column, bt didnt knw it was my frd!..oh, i m so proud! Nithi. this is a very happy moment..! 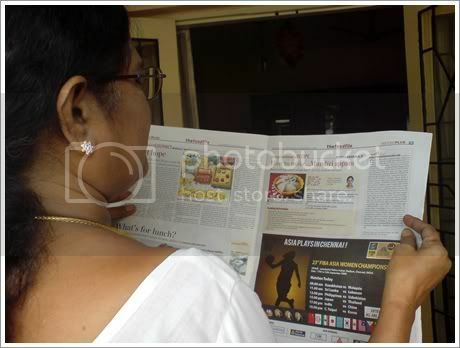 Mom is very happy reading your recipe in newspaper..! Yummy too..! Wishes dear! Oh!!! Really happy to note about it and Congrats on the victory. I'll see the paper right now. Good. Ur rocking at both Blog & Newspaper.Congrats !!!!!!!! All the best. Congrats dear ,very proud of u ...Amazing job .....keep rocking ..
Congrats Nithya! Your mom must be really proud. Keep going! Great moment nithya. Heartfelt congrats to u.
Congrats nithi.. Wish U have many more like this..
wow congrats, you have such a beautiful blog dear, thanx for visiting my blog, first time here, Oh! what is lot of interesting to me was you have baked so many things that is really good, & what lovely pictures, will be visiting you often, keep on blogging..
Conrats Nithya, great going. Feel so happy for you. hearty congratulations Nitya....wish you get many more happy days like this one. I had a lil smile on my face when i saw it too.. in ur blog !! Wow congrtas Nitya.U really deserve it.Great job. Congratulations Nithya! This is great news! I'm sure your mom must have been so proud of you! You should now formally change your profile description - you are no more a fresher to the kitchen - you are a gifted and talented chef who is beginning to make it big! You might soon have your own show on TV! Good luck! Congrats dear! Proud of you. Congrats dear.....thats really an achievement and its a pleasur eto be on a Newspaper.Keep up the good work. I can imagine how happy u must have been, cos just recently i too had mine posted in a magazine. Congrats Nithya, Gr8t work ! Congratulations! !..Great work!!. Thank you so much for all ur comments on my posts. I have already added my entry for your event. Here's the link. Since you have restricted one entry per person, haven't tried 'nother one:). Have a wonderful day!! WOw, congratulations..U r rocking !! Please ccllect ur gift from my blog. Hey Nithya, thanx for your kind words in my blog. You have a great one here and I see you are very well rewarded by an appearance in the papers :)..
Congrats nithya,My hearty wishes to you. Back after a break. 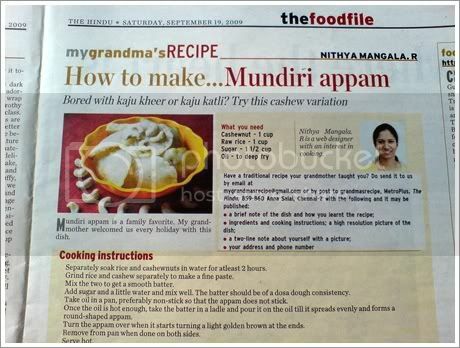 yet to catch up with your recipes.Congrats Nithya. this is a great achievement. your parents must have been very proud of you. This is really something to be proud of !! my heartly congrats..
That is so cool, Nithya! Congrats! hearty congratulations.Hindu enna jujippi..innum BBC, CNN, evlvo irukku..kalakkunga. Wonderful, lovely!!!! Congratulations and time for celebrations!! !You deserve it for such a hard work and creativity!!! Hi Nithya, very much inspiring :) ... congratulations! congrats Nithya. I like your blog and recipes.